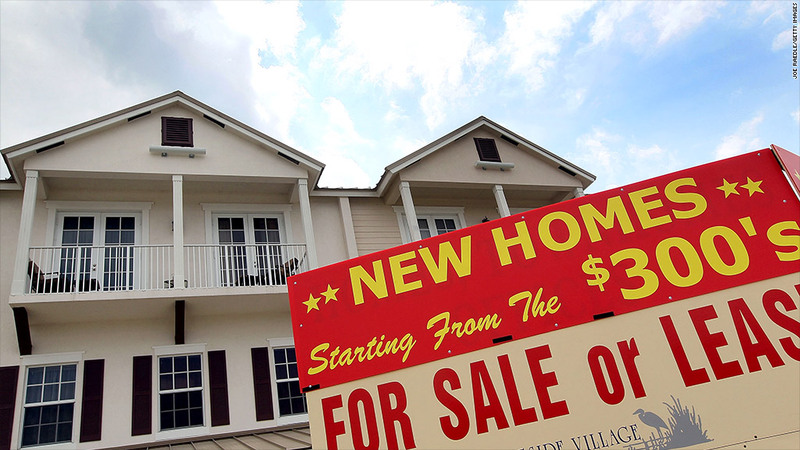 New home sales surged in October, according to a government report. New-home sales are surging, according to a report from the U.S. government on Wednesday. Sales of new single family homes jumped to a seasonally adjusted annual rate of 444,000 in October, up 25.4% from the previous month's revised rate, according to a report issued by the Commerce Department. The rate was the highest level in six months. On a year-over-year basis, sales rose nearly 22%. Keith Gumbinger, vice president of mortgage information site HSH Associates, said that this year's stock market gains could be the prime factor in driving the housing market. "It may very well be that a lot of folks are feeling better about their prospects and buying a new home," he said. Another key reason could be easier financing for buyers, as "builders are motivated to get folks into homes," Gumbinger said. While 30-year fixed mortgage rates are about a percentage point higher than they were in the spring, they are off the recent high of 4.58% set in August, according to Freddie Mac. In the week ended Nov. 27, the rate was 4.29%. Gumbinger also said that inventories of existing homes are thin in several markets, prompting people to build new homes rather than buy old ones. Nationwide, the government said there is enough new home inventory to last for 4.9 months, if the market manages to maintain its October rate of sales for that time. While the sales jump is impressive, the rate remains less than half that of the peak of the housing bubble; in 2006, the annual sales rate topped 1 million. The median sales price of a new home was $245,800 in October and the average sales price was $321,700. The report said the South is the hottest market for new-home sales, while the Northeast is the slowest.